New Delhi: A Lok Sabha panel probing allegations that members of Parliament (MPs) were bribed to vote in favour of the United Progressive Alliance (UPA) government in the 22 July trust vote gave a clean chit to two politicians even as committee members belonging to the Opposition Bharatiya Janata Party (BJP) and the Left submitted dissent notes while differing with the conclusions. “Amar Singh, the main accused was not quizzed by the committee. Action should have been taken against Singh, which did not happen," Argal said. 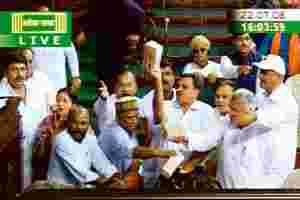 The committee was appointed by Lok Sabha Speaker Somnath Chatterjee after the three MPs—Argal, Mahavir Bhagora and Faggan Singh Kulaste—waved bundles of cash after storming the well of the House even as it was debating the trust motion. Although the report says that “the common strain among all the allegations zero in on Amar Singh", it concluded that there is “no case" against Patel and there is no “clinching evidence" against Singh. CPM’s Salim also alleged that the committee has even refused to add his dissent note as it was. But Deo said the parts in the dissent notes given by both Salim and BJP’s V.K. Malhotra were removed as they were “casting aspersions" on the committee itself.